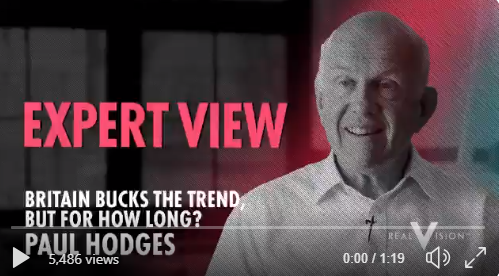 In my interview for Real Vision earlier this month, (where the world’s most successful investors share their thoughts on the markets and the biggest investment themes), I look at what data from the global chemical industry is telling us about the outlook for the global economy and suggest it could be set for a downturn. “We look at the world and the world economy through the lens of the chemical industry. Why do we do that? Because the chemical industry is the third largest industry in the world after energy and agriculture. It gets into every corner of the world. Everything in the room which you’ll be watching this interview is going to have chemicals in it. And the great thing is, we have very good, almost real time data on what’s happening. 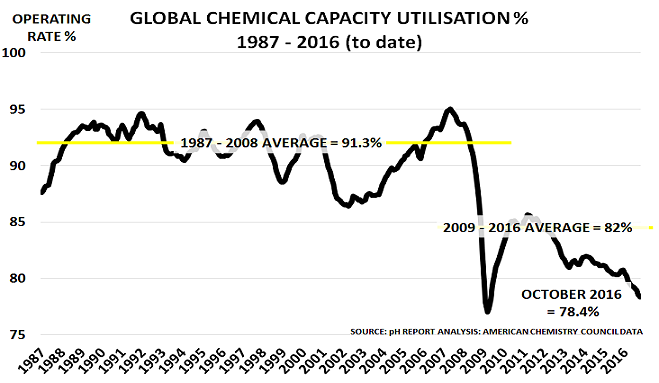 “Our friends at the American Chemistry Council have data going back on production and capacity utilization since 1987. So 30 years of data, and we get that within 6 to 8 weeks of the end of the month. So whereas, if you look at IMF data, you’re just looking at history, we’re looking at this is what’s actually going on as of today. “We look, obviously, upstream, as we would call it, at the oil and feedstocks markets, so we understand what’s happening in that area. But we also– because the chemical industry is in the middle of the value chain, you have to be like Janus. You have to look up and down at the same time, otherwise one of these big boys catches you out. “And so we look downstream. And we particularly look at autos, at housing, and electronics, because those are the big three applications. And of course, they’re pretty big for investors as well. So we see the relative balance between what’s happening upstream, what’s happening downstream, where is demand going, and then we see what’s happening in the middle of that chain, because that’s where we’re getting our data from. “As the chart shows, our data matches pretty well to IMF data. It shows changes in capacity utilization, which is our core measurement. If if you go back and plot that against history from the IMF, there is very, very good correlation. So what we’re seeing at the moment– and really, we’ve been seeing this since we did the last interview in November— is a pretty continuous downturn. “One would have hoped, when we talked in November, we were talking about the idea that things have definitely cooled off. Some of that was partly due to the oil price coming down. Some of that was due to end of year destocking. Some of that was due to worries about trade policy. Lots of different things, but you would normally expect the first quarter to be fairly strong. “The reason for this is that the first quarter– this year, particularly– was completely free of holidays. Easter was late, so there was nothing to interrupt you there. There was the usual Lunar New Year in China, but that always happens, so there’s nothing unusual about that. And normally what happens is, that in the beginning of the new year, people restock. They’ve got their stock down in December for year end purposes, year end tax purposes, now they restock again. And of course, they build stock because the construction season is coming along in the spring and people tend to buy more cars in that period, and electronics, and so on. As we note in this month’s pH Report, however, this picture is now finally changing as concern mounts over oil market developments – where unplanned outages in Venezuela and elsewhere are adding to the existing cutbacks by the OPEC+ countries. Apparent demand is therefore now increasing as buyers build precautionary inventory against the risk of supply disruption and the accompanying threat of higher prices. In turn, this is helping to support a return of the divergence between developments in the real economy and financial markets, as the rise in apparent demand can easily be mistaken for real demand. The divergence is also being supported by commentary from western central banks. 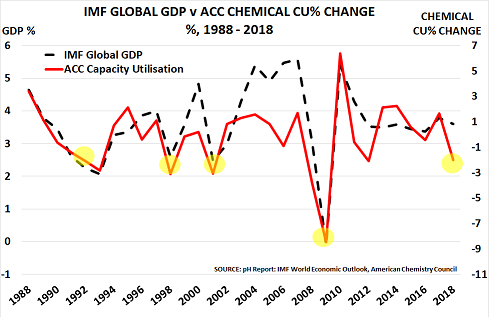 This month’s IMF meeting finally confirmed the slowdown that has been flagged by the chemical industry since October, but also claimed that easier central bank policies were already removing the threat of a recession. We naturally want to hope that the IMF is right. But history instead suggests that periods of inventory-build are quickly reversed once oil market concerns abate. Please click here if you would like to see the full interview. The chemical industry is the best leading indicator that we have for the global economy. It has an excellent correlation with IMF data, and also benefits from the fact it has no “political bias”. It simply tells us what is happening in real-time in the world’s 3rd largest industry. Sadly, the news is not good. Of course, nobody ever wants to forecast recession. And there are always plenty of reasons why something might be “different this time”. But it would certainly seem prudent for companies and investors to develop a Recession Scenario for their business for 2017. given the track record of the CU% indicator. Of course, many of the same people who said that Brexit would never happen, and that Trump would never win, are now lining up to tell us everything will still be the same in the end. But they should really have very little credibility. What many investors also seem to be forgetting is that Trump has been a long-time CEO. And new CEOs normally write-off everything in their first year of office. This gives them the double bonus of being able to (a) blame the previous CEO and (b) then take credit for any improvement. As Trump would no doubt like a second term of office from 2021, he has every incentive to “clear the decks” in 2017. 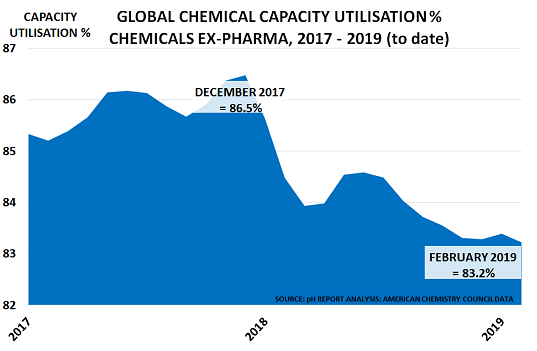 Chemical production is currently the best leading indicator for the wider economy, as financial markets have lost their power of price discovery due to the impact of central bank stimulus. The above chart, based as always on the excellent American Chemistry Council (ACC) data, continues to flash the orange warning signal first seen last month. The key issue then was the very worrying slide in operating rates during the seasonally strong Q2. As the ACC had noted then, ”growth stalled in Q2“. Some individual countries have also seen very sharp falls. Germany, for example, has gone from 4.8% growth in February to a fall of 3.5% in August. India has crashed from 12.9% growth in January to 3.4% in August. Japan has fallen from 9.2% growth in March to just 0.8% in August. Mexico has gone from 1% growth in April to a 2.8% fall in August. Russia has gone from 4.2% growth in January to a fall of 10.4% in August. Only one major country has maintained a relatively strong growth level – China. It peaked at 11.1% in April, and saw 8.8% growth in August. But, of course, this stability is due to its shift to become an exporter, rather than importer, following the loss of its downstream markets in the West. This confirms the blog’s conclusion yesterday when discussing Sinopec’s financial performance. The sharp global slowdown now underway confirms that companies and investors have been the victims of a collective delusion in recent years. We accepted the assurances of the central banks that they could easily restore growth to previous Boomer-led levels, despite the ageing of the global BabyBoomer population. But central banks can only print money, they can’t create babies. And only babies, when they grow up, can create sustained demand growth. Chemical production data doesn’t lie. It makes clear that we are instead heading for an abrupt change of economic course as we enter the New Normal. The chemical industry is the best leading indicator for the global economy. The slide in operating rates (OR%) around the world during the seasonally strong Q2 period. is a clear warning that global economic growth may be stalling. The chart also confirms last month’s comment from Dow CEO, Andrew Liveris, that “for a couple of years after 2008, we had a head-fake that the growth might have returned, but it didn’t”. OR% temporarily jumped to around 87%, but then fell back again – despite massive continued stimulus by governments and central banks. The same realisation also seems to be dawning in financial markets, which have only been held aloft by a wave of debt. Now investors will have to wake up to the fact that most of the debt will never be repaid. Companies also need to review the $123.5bn of new US shale gas-related projects, as most will prove unprofitable due to lack of demand. Q3 is the time when budgets and strategies are set for the next few years. So it is not too late for a change of course. Otherwise, in 5 years’ time, when all this new capacity is online, new managements will scratch their heads and wonder how the industry maintained the collective delusion for so long. But by then, the money will have been spent. Recovery has been delayed, again. That is the clear message from the blog’s extensive discussions with key executives in global and regional markets over the past 2 weeks. Critically also, we are in October, normally one of the 4 seasonally strongest months for demand in the year (January, March, May are the others). Plants should be running at peak rates to complete orders before the holiday season arrives. None of this will come as a surprise to blog readers. But it is clearly coming as a major shock to financial markets, who have been convinced that recovery had now become inevitable. The blog’s own conversations with Wall Street analysts, for example, reveal incredulity that this might be happening. Most have instead been publishing research notes since May that said the precise opposite. Of course, policymakers also have an easy excuse for their mistake. They can and will simply blame the US budget/debt ceiling debate, which has also taken them by complete surprise. Then they will probably also be totally shocked to find that Germany’s new government, as and when it is formed, is not prepared to hand over large amounts of money to bail out Southern Europe. The butterflies that the blog described in its August New Statesman article are now flapping their wings very hard. Please be careful out there. It is already getting quite scary. Brent crude oil, blue, down 1%. The next few decades will see very much slower economic growth in most countries. This will have critical implications for business strategy, as the blog summarises in a new Research Note. Encouragingly, the Financial Tmes has devoted a column to its argument, focusing on the implications for the UK. Tomorrow, the blog will highlight the key implications of these changes for Company Boards and senior executives.